The Opéra de Montréal announced the lineup of its 2016-2017 season at the pressroom of the Olympic stadium on March 3. The list of performances includes Aida, Don Giovanni, Dialogues des Carmelites and La Bohème, but it was the announcement of a new operatic adaptation of The Wall by Roger Waters, a founding member of Pink Floyd, that really had people talking. 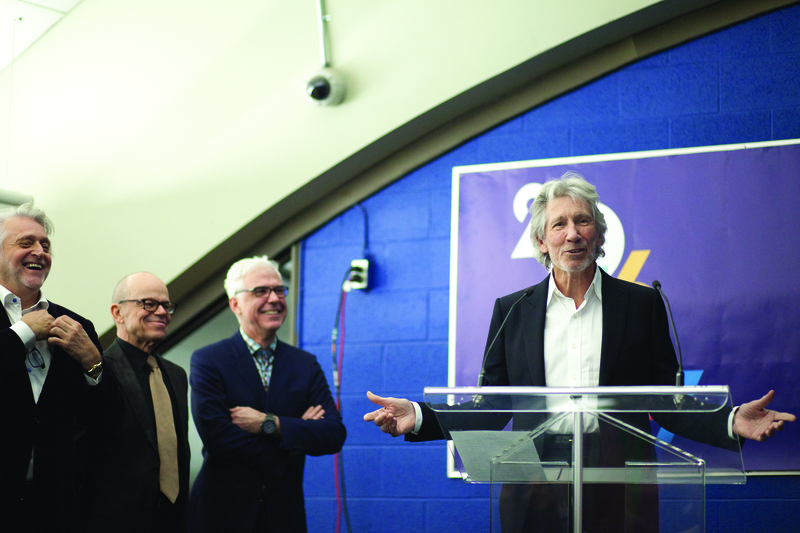 Roger Waters spoke at the Opéra de Montréal’s upcoming season announcement on March 3. Photo by Marie-Pierre Savard. This new piece, entitled Another Brick in the Wall – the Opera, will be part of the celebrations marking Montreal’s 375th anniversary. Waters, representatives of Opéra de Montréal and Montreal’s 375th Anniversary Committee were present at the announcement. Waters said he was initially dismissive when he was first presented with the project because most symphonic versions of rock music he had heard sounded disastrous. “They [usually] stick slavishly to the melody,” he said, which is why he has consistently rejected all requests for commercial presentations of The Wall. Waters said he had not really been involved in the development of the project so far. Composer Julien Bilodeau has been given complete creative freedom over the music, which he said is a dream come true, but Waters remains the librettist—the words are his. Another Brick in the Wall – the Opera will be presented next March and will feature an all-Canadian cast. Michel Beaulac, the OdM’s artistic director, described the season’s lineup as an operatic journey spanning two centuries of music, which includes several classical works. He explained that traditionally the Opéra de Montréal launches and ends each season with popular operas that he referred to as “blockbusters.” Those would be Aida in September, a grandiose, yet tragic tale of love and betrayal that is set in politically unstable Egypt; and La Bohème in May, a tale of love, youthful dreams and illusions. Waters has created an operatic adaptation of The Wall that will be shown in the 2016-2017 season. Photo by Marie-Pierre Savard. Beaulac said he is completely committed to casting Canadian artists as much as possible and that 80 per cent of this season’s casts are Canadian. He added that young Canadians who have taken off in the operatic world across the globe would play most of the roles in Don Giovanni. “I chose that work because I could put together all those young artists who are great ambassadors for both Montreal and for Canada,” he said. Beaulac remarked that planning an opera is not easy, but it is important to have the best artist for each role. This means that in addition to possessing the right singing voice, they have to look the part and be able to act the role convincingly. He said he never schedules an opera until he has succeeded in attracting the artists he wants for each role. Subscriptions for the season or single tickets can be purchased at the box office at Place des Arts or at operademontreal.com. The Opéra de Montréal offers a special rate of $25 for front row seats for all their productions to all students under 30.